Thorndike, Me. : G.K. Hall & Co., 1993. A large print, hardback reprint of Dance Hall of the Dead. 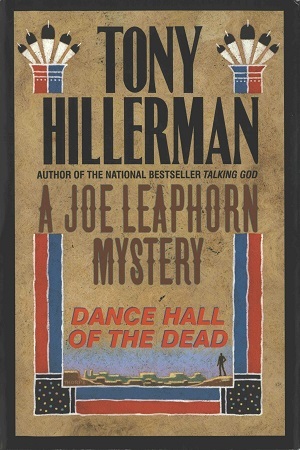 The front cover of the dust jacket is a reworking of the back cover art Peter Thorpe had created for the 1990 Harper Paperback edition of Dance Hall. The graphic of a three-cornered yei figure creates a frame for a simple depiction of mesa country at the bottom of the cover. An erect figure is silhouetted at the lower right. This design is exactly replicated on the paperback edition of this large print release. In fact, the cover design and art is repeated for all of G.K. Hall's large print editions of Tony Hillerman's Navajo Detective series. "The Joe Leaphorn Mystery Series," "The Jim Chee Mystery Series," and "The Joe Leaphorn/Jim Chee Mysteries Series" were all copyrighted by Tony Hillerman in 1989, which explains the addition of the novel's secondary title. Binding: Grey paper-covered boards with blue cloth binding at spine. Silver ink imprint along spine. Dust jacket with full cover graphic on front cover and text in black on white ground on back cover.